I was walking up Broadway yesterday, headed to the green market in Union Square from a shopping trip to SOHO. Reaching 4th Street I heard the sound of drumming, form one of those guys who use discarded plaster compound buckets as drums. But there was more than a bucket- a sound similar to cymbals, and the hard sound of the guy beating on the concrete sidewalk. I don’t know anything about drumming, or rhythm or beats for that matter, I couldn’t tell you the difference between a syncopated beat and one that isn’t. I have no natural sense of rhythm. But I know a beat that catches something inside of me and makes me want to see who or what is making that noise. So I stopped to look. It was a black man across the street, on the west side in front of one of the NYU buildings. 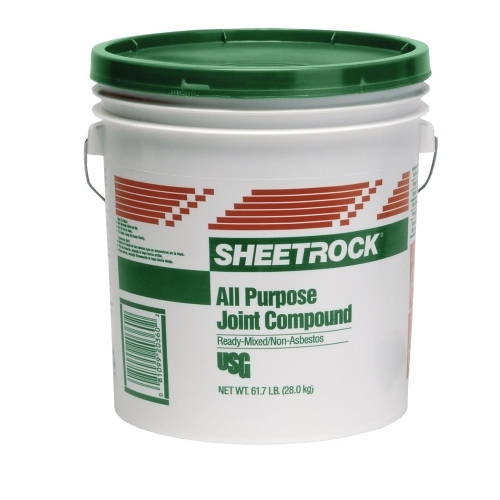 He sat on a box, and arrayed in front of him he had one of those empty compound buckets, a white with green lettering Sheetrock bucket that I’m familiar with from renovation and repair work. He had an empty post office plastic box that was being used as both a drumming surface and a place for you to put your money donations in. There were also a few aluminum food trays, the source of the cymbal sounds. He was using a pair of wooden salad spoons as drumsticks. His hands were constantly moving, and one unshod foot was holding down an aluminum pan, which he constantly adjusted to get a different sound from. I dropped $2 in the bucket, and he kept playing, not seeming to notice. Most buskers say “thanks” when you put money in the basket, but this guy seemed to be in his own little world of resentment. I once saw a woman strapped to a stretcher being carried out of a building on West 47th Street, and she caught my eye as I stopped to let the EMS guys wheel her by. “Mister, help me! They’re gonna kill me!” She had a desperate feral look in her eyes that told me she really believed they were going to kill her. This guy drumming had a similar look, the look of pure survival instinct. I did not resent the fact that he didn’t say thanks; I’ve encountered enough hurt people in the world to understand they don’t know any better. 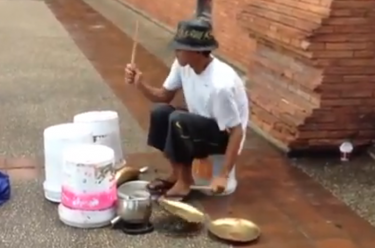 I felt a little sad that someone who could play drums like that was living in the street and hating everybody that walked by. I’ll never know what his story is, I just have a general idea that drugs and mental illness might be a part of it. 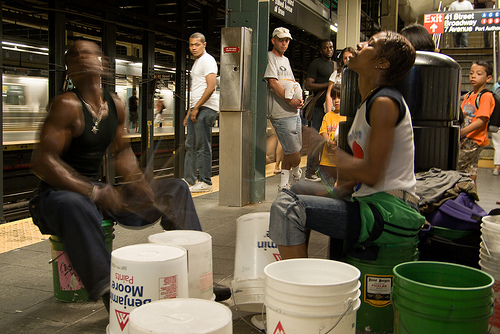 There is a couple that drum on the subway; they are sort of famous, with lots of YouTube videos and pictures on line. Again, these are amazingly talented people who again for whatever reason spend their time eking out a living from money dropped in a bucket. They have kids, too; the first time I saw them there were 3 or 4 small children twitching to the beat as they watched their parents earn dinner money. The kids were cute, ranging in age from 5 to 10 years old, but I wonder what kind of memories they’ll have after spending many a night on the West 4th Street F train platform instead of being home watching TV or playing in a park. I give money to street musicians, especially the ones like these, the homeless, the borderline homeless, the unmanageable. I’ve been there myself, and I try not to judge, I don’t care if the guy’s going to buy crack, heroin, or a bottle of Swiss-Up with the money, I just care that he entertained me and I wanted to show my appreciation. This entry was posted in Uncategorized and tagged being judgmental, being non-judgmental, busking, compound buckets, drug addiction, giving, homelessness, mental illness, Street drummers, subway musicians, the streets of New York, unmanageability. Bookmark the permalink. I love that you appreciate music wherever you may be.